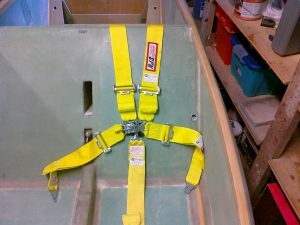 This chapter covers the making of the head rests, the aft heat duct, the attachements for the seat belts and the steps. The modifications I am doing will now result in alternative ways of doing some of the things. In this chapter I will probably skip the head rests for now. The plans canopy is side hinged, while I will make a forward hinged canopy (FHC). That makes the attachement of the head rests different. The head rests provide some protection in case of a roll over, but is not good enough as a sole roll over protection. I will in my FHC design make a roll over bow that my canopy will be attached to (se ch#18 when I have gotten so far). The plans calls out for 4 point seat belts. I have bought 5 points with a crotch strap to prevent “submarining” in case of a crash. This calls out for me having to make a 5th attachment point for the crotch strap. I’m not sure how I will do this – or if I just skip that point. Time will show. The harness can be used without the 5th strap. I plan to paint the plane yellow, so I’ve decided to have yellow seat belts. The upholstery will also be yellow in some way. The step as called out in the plans are also obsolete when I makes the extended strakes. The step will be to much aft. Instead I will make retractable steps aligned with the intrument-panel, and one on each side. I plan to copy Wayne Hicks steps.